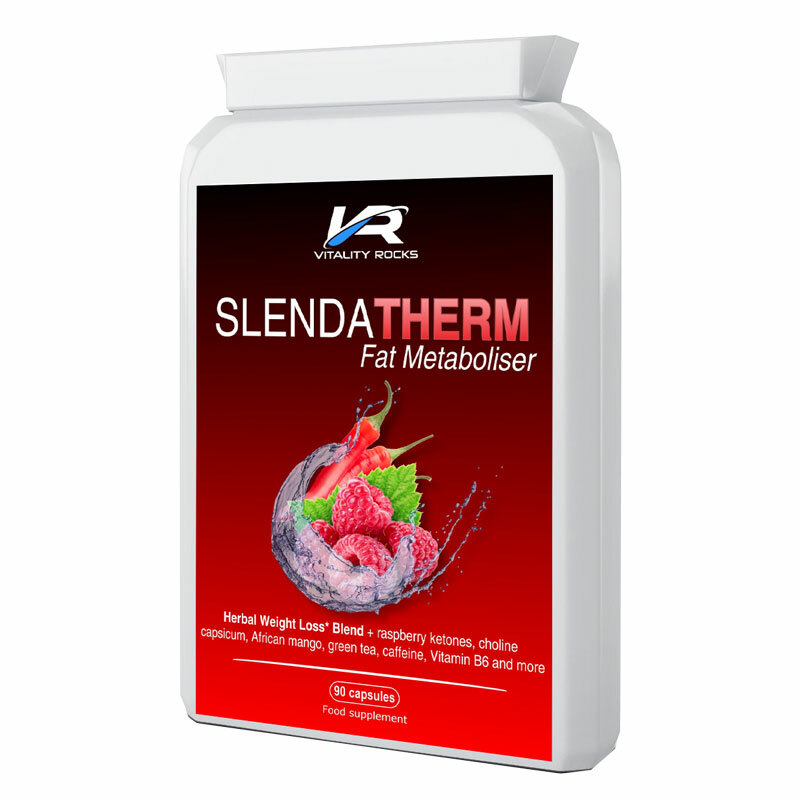 If you are struggling to control your weight, try Vitality Rocks' SlendaTherm to get you on the right track. When we set out to source our SlendaTherm supplement, we had in mind a product that would deliver all that was expected of it and more! Sticking to our Vitality Rocks™ values, we demanded the product be as natural as possible and have as many added benefits that we could squeeze into every easy to swallow capsule. Vitality Rocks™ SlendaTherm Raspberry Ketones based complex contains Glucomannan which, when taken in combination with an energy restricted diet, contributes to weight loss. 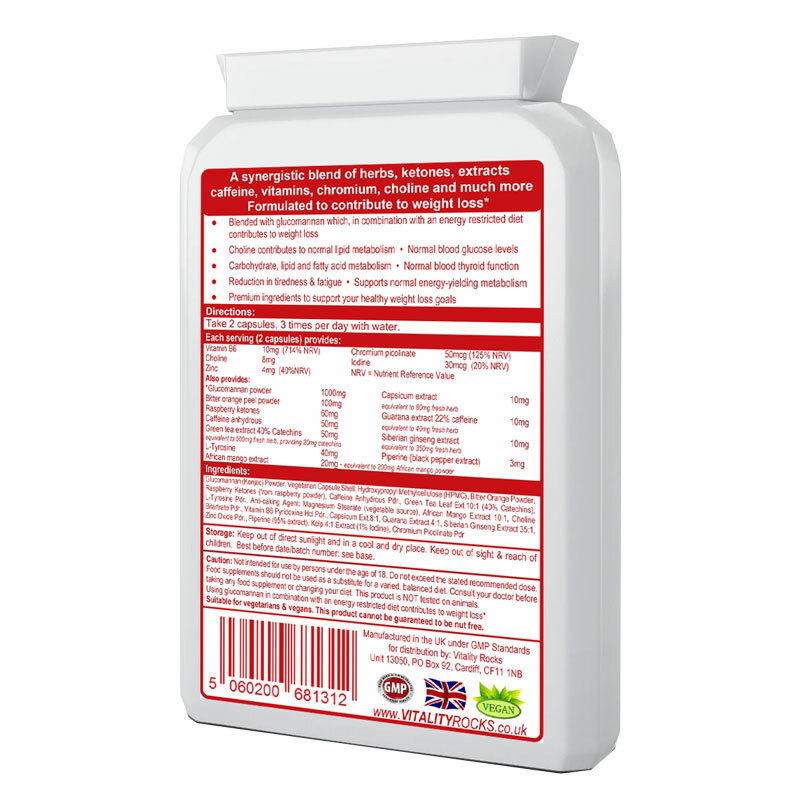 This makes our SlendaTherm supplement popular with those aiming to lose weight. Taking our formulation a step further, we've added Green Coffee extract which may support a healthy metabolism and stable blood sugar levels and African Mango extract which is popular among dieters as a 'carb blocker' and energy booster in its own right. Furthermore, Capsicum, Guarana, Siberian Ginseng and Piperine are all contained in these easy to swallow capsules which are certain to turn up the heat on your fat reduction targets! Chromium Picolinate is also there and may help alleviate sugar 'spikes' and hence reduce cravings, hunger pangs and the need to binge! Chromium contributes to normal macronutrient metabolism and to the maintenance of normal blood glucose levels. 2 capsules to be taken 2 to 3 times per day with water. Glucomannan (Konjac) Powder, Vegetarian Capsule Shell: Hydroxypropyl Methylcellulose (HPMC), Bitter Orange Powder, Raspberry Ketones (from raspberry powder), Caffeine Anhydrous Pdr., Green Tea Leaf Ext.10:1 (40% Catechins), L-Tyrosine Pdr., Anti-caking Agent: Magnesium Stearate (vegetable source), African Mango Extract 10:1, Choline Bitartrate Pdr., Vitamin B6 Pyridoxine Hcl Pdr., Capsicum Ext.8:1, Guarana Extract 4:1, Siberian Ginseng Extract 35:1, Zinc Oxide Pdr., Piperine (95% extract), Kelp 4:1 Extract (1% Iodine), Chromium Picolinate Pdr.